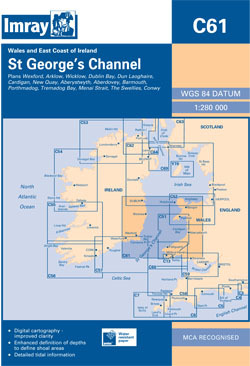 The St. George's Channel and Irish sea from Fishguard and Wexford to Dublin and Liverpool. Scale: 1 : 270.000. Two-minute gridlines. Larger scale plans of Portmadoc, Aberystwyrth, Tremadoc Bay, Barmouth, Menai Strait, Aberdovey, Cardigan, New Quay, Dublin Bay, Wexford, Arklow, Wicklow and Dunmore East.